They Maybe Big but Certainly Not Bad. 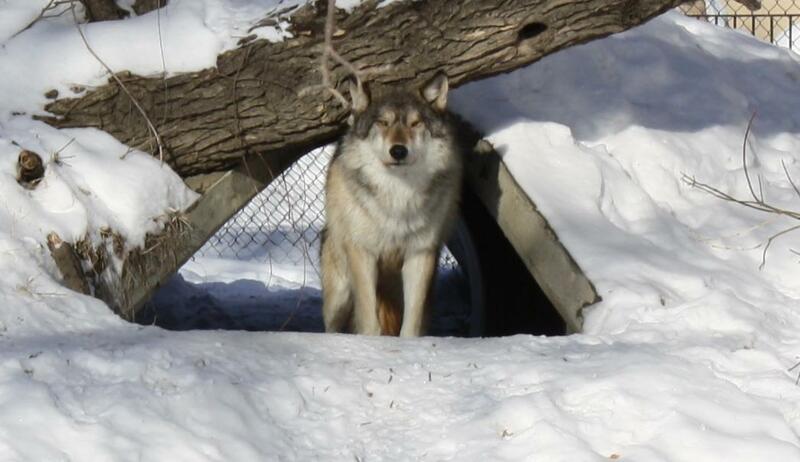 The Grey Wolves are back at the Roosevelt Park Zoo. - Word on the street with Visit Minot!Word on the street with Visit Minot! Little Red Riding Hood better be minding her own business because the wolves have made their way back to the Roosevelt Park Zoo. The man of the house Gage who is seven years old spent his “vacation” at the Bramble Park Zoo in Watertown, SD. Gage called Roosevelt Park Zoo home before the flood of 2011 so it was an emotional home coming for many of the zoo staff when reunited with the handsome fellow. The new ladies on the block Luna & Denali just one year of age have recently became residents of the Minot Area. We welcome them as they make the transition from Bear Country USA in Rapid City, SD. The ladies and gent were introduced to their new home outside only a few short weeks ago and it has been a scene similar to one that you would find at that first awkward junior high dance. The one were the girls come up behind the boy and the boy turns around gives them look of disgust and runs the other direction. Although Gage is playing hard to get they all seem to be getting along wonderfully and we can’t wait for you to meet them in only 81 days at the Grand Opening for the Roosevelt Park Zoo! Take a peek at the wolves in action by visiting our Youtube page.